The white continent of Antarctica has beckoned the longing of scientist and explorers since ever. A breathtaking diving expedition has brought me face to face with the predator of the Antarctic Peninsula. The Leopard Seal, predator of the Antarctic Peninsula. Aboard a chartered sailing boat, we are heading for Pléneau Island, an area known for spotting the largest phocid in the world, the Southern Elephant Seal (Mirounga leonina), a particularly massive animal with thick blubber. When sexually mature, males develop an elongated snout with an inflatable proboscis. Six different kind of seals are living in Antarctica: On our voyage we could sight the Weddell Seals (Leptonychotes weddelli), Crabeater Seals (Lobodon carcinophaga), Leopard Seals (Hydrurga leptonxy), Antarctic Fur Seals (Arctocephalus gazella) and Southern Elephant Seals (Mirounga leonina). Concealed left the solitary Ross Seal (Ommatophoca rossii) that favors heavy, consolidated pack ice and rarely goes ashore. The sea life along Pléneau Island turns out to be remarkable coloured and varied. Sea urchins, big red starfishes, sponges and huge isopods strew the sea ground. More rarely spread are nudibranchs crawling over the rocky seabed and in shallow water I distinguish several Antarctic Spiny Plunder fishes (Harpagifer antarcticus). Then, in the late afternoon, a curious solitary Leopard Seal appears along the boat. Some excitement comes over us. Although attacks by Leopards Seals on humans have been documented, we are looking forward diving and snorkelling with this top predator of the Antarctic waters. Leopard Seals are named after their spotted coat. They are fearsome hunters with a large almost reptilian like head and strong jaws. Their main sources of food are penguins, krill and even other seal species. Typically at the end of summer season, they will lie and wait on an ice ledge, pouncing on the first juvenile penguin to dive into the water. I slowly slide down into the icy water, avoiding chasing the animal away. 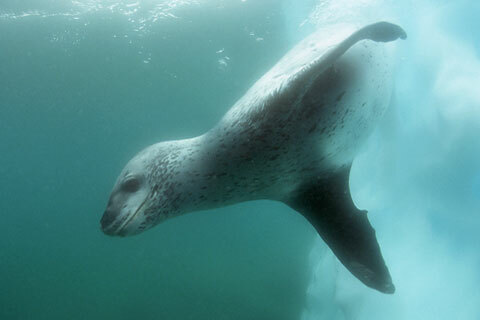 Immediately, the Leopard Seal comes closer, but still stays upon a distance. I can distinguish its slender streamlined body with long flippers; build apparently for speed and power. For a while the animal seams to enjoy my presence but the situation turns rapidly in a complete reversal. The closer the encounter with the seal, the more it seams to be stressed. Then suddenly, the Leopard Seal attacks. In a last desperate move, my camera housing helps me to keep a safe distance from this seal’s formidable jaws, long canines, well suited for grabbing prey. Time to break off and get back to the boat.